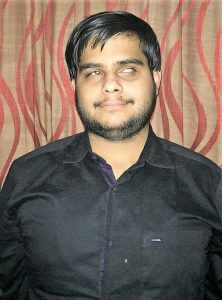 20 year old Mukul Sharma is a resident of Delhi and visually impaired by birth. He has completed his schooling from a regular CBSE school which is well-equipped with teaching techniques for children with disability. His school provided him with a special educator in junior classes, who taught him the skills of reading and writing Braille as well as using Taylor Frame for Mathematical Concepts. When he reached 3rd standard his teachers taught him computers with the help of JAWS software. He has been in touch with National Association for Blind (NAB) Delhi throughout his childhood and learnt indoor mobility using indoor techniques and white cane. Mukul has done a basic computer course at NAB, where he was trained for JAWS and NVDA along with the basic computer operations including typing, surfing, emailing and learning about Microsoft Office applications. He gave his Xth CBSE board exams including Computer and scored 82%. After the basics he enrolled himself in the Advanced Computer Course in 2015. While working on the computer he faced issues in representing mathematical questions and approached NAB Helpline for assistance. In response Eyeway Counselor gave all possible assistance to helping Mukul ressolve his issues. The counselor has been in constant touch since and keeps updating Mukul with the latest assistive technologies which help him in his day-to-day life. With the guidance of Eyeway Counselor and knowledge of assistive technology, Mukul got the confidence to do his graduation from a regular college and he is currently pursuing Bachelor’s in English (Honors) from Shaheed Bhagat Singh College, Delhi University. Our counselor also guided Mukul in using a smartphone with the aid of Voice Over software, an inbuilt accessibility feature on both iPhone. He was informed about the “Seeing AI” and “Be My Eyes” free apps. “Seeing AI” also known as Talking Camera is an app that narrates the world around you and “Be My Eyes” is an app for visual assistance through live video call to visually impaired people. Mukul now accesses Whatsapp, email for communication purpose, Ola and Uber apps for commuting and other apps for mobile banking on his smartphone. All these apps have helped Mukul to gain ease of access and independence in his daily functions. Mukul’s family is happy that Eyeway has been able to mould him into an independent person, the way they brought him up along with his siblings, ignoring his visual impairment as a disability.